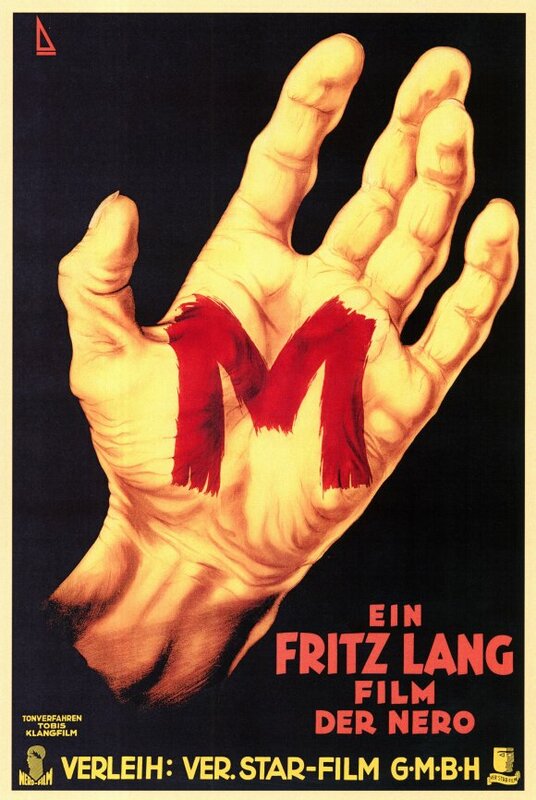 Retro Review: Fritz Lang’s M: The Birth of the Psychological Horror Film in a Gorgeous Digital Restoration at the Plaza Theatre! M (1931); Dir. 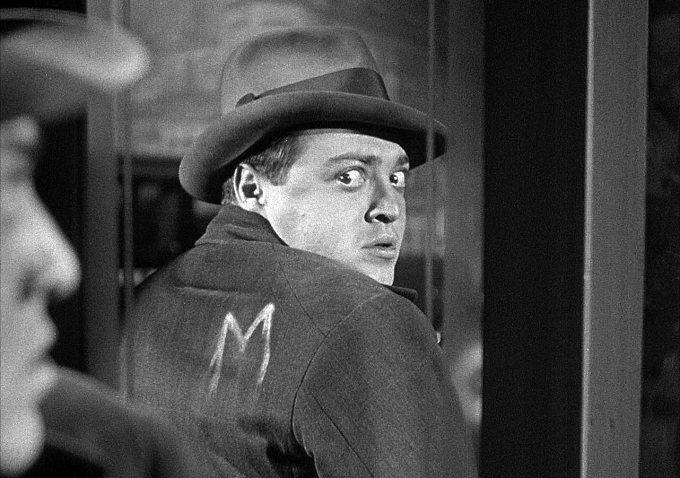 Fritz Lang; Starring Peter Lorre, Otto Wernicke and Gustaf Gründgens; Starts Friday, May 10; Plaza Theatre; Trailer here. Starting this Friday, the Plaza Theatre allows us a look at where an entire subgenre of cinema—the psychological horror film—emerged by presenting a beautiful digital restoration of Fritz Lang’s pioneering classic M.
Hannibal Lecter and Jame “Buffalo Bill” Gumb. Norman Bates and Patrick Bateman. Frank Zito and Mark Lewis. Fictional serial killers of cinema, all driven by deeply cast and untamable desires to murder. Each one has their set of forebears and influences, but the family tree for the entire group springs from a single source. Not just a single source, but a single letter: M.
A series of child killings is plaguing Berlin, perpetrated by the seemingly mild-mannered Hans Beckert. As Beckert’s crimes intensify, police presence on the streets of the city increases in response. The relatively “good” criminals of Berlin—the pickpockets, beggars, safecrackers, pimps and prostitutes of the city’s streets—see their professions being stifled by the police raids carried out in search for Beckert, and they organize a manhunt of their own. Hans Beckert becomes a man pursued by both sides of the law, impotent to stop the drive to kill that fuels his crimes, and his time is rapidly running out. The primary feeling that pervades M is an overwhelming sense of societal unease. The murder of innocent children has set neighbor violently against neighbor. Those in charge of upholding the law are seen as no different from the criminal underworld of Berlin. Practically everybody in the film, save for the children, is physically repulsive and morally suspect. The entire city seems to be in shadows, every bar and meeting place a dive grubby with the accumulation of decades of cigar smoke, spilled drinks and half-eaten food. The glamour of Berlin in the 1920s has passed into the pulse-pounding hangover of the early 1930s. It’s the waning days of the Weimar Republic, and the decadence of the era has given birth to monsters. And the monster in our crosshairs is Hans Beckert. And yet he’s one of the only truly relatable characters in the film. Unlike those who would pursue him, though, Beckert is a man without a choice. He’s filled with self-loathing at the unspeakable acts that he is compelled to carry out, yet he is unable to stop himself. Those on his tail have chosen their vices and created their own fates. Beckert’s fate is foisted upon him by either an accident of genetics or by the society into which he was born, and from the ugly way Fritz Lang paints German society circa 1931, we can safely assume that the author intends society to be on the hook for this one. Lang and the film’s writer Thea von Harbou (Lang’s wife at the time) created the modern serial killer-themed psychological horror film with this landmark piece of cinema. By removing all sense of mystery from the story and showing the guilty party in practically the first frame, the movie is allowed to delve into Beckert’s damaged psyche, to witness how his actions resonate within the greater society and to generate suspense not from the uncovering of clues, but from seeing the forces on either side of the law slowly closing in on the film’s protagonist and wondering how they will eventually catch up with him. It’s a genius move, and the end result is a film that feels contemporary in its sensibility rather than one that treads the well-worn path of detective fiction. And unlike most early talkies, Lang’s use of sound is complex and evocative. The film’s opening sequence, in which Beckert pursues the young Elsie Beckmann as his latest victim (a sequence in which we do not see his face, but hear his voice), is cross-cut with another scene playing out at Elsie’s apartment building as the girl’s mother waits for her. As the sequence concludes, Elsie’s mother calls out for her repeatedly. With each call we are shown a different, empty location, and each time the mother’s voice becomes fainter and fainter until it’s clear that Elsie can no longer hear that call. It’s a purely sound-driven sequence that was incredibly forward-thinking for its time. Similarly, Lang depicts two meetings in visually similar locations—one, a meeting of the policemen and the second, a meeting of the criminals—and cross-cuts between them on dialogue cues to create a sort of counterpoint which drives the parallel action. Lang also lifted the concept of the leitmotif from opera as a sound-based storytelling device. Beckert has a habit of whistling a few bars of “In the Hall of the Mountain King” by Edvard Grieg, and as the film progresses, the use of the music becomes an announcement to the audience that Beckert is nearby. 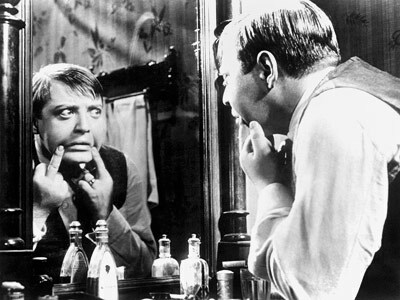 And finally, Peter Lorre delivers a performance that few actors of any generation could approach. As Beckert, Lorre segues from joviality to intense self-loathing, from desperate pleading to furious anger, with nary a seam showing and never seeming artificial or overly theatrical in his approach. He makes Beckert a fully rounded human character, practically alone among the grotesques that populate the Berlin of the movie. It’s a tour-de-force, with his climactic confrontation and breakdown being one of the most effective performances he would ever deliver. It’s the performance that made him a star, as he would flee Germany in 1933 to find international success waiting for him in Paris, London and Hollywood. M is both contemporary in its feel and a snapshot of a particular place at a particular time. And it’s not a pretty picture. Lang had first-hand experience of the changing weather of Germany: production on the film was nearly shut down based on the Nazi party’s reading of the original title—MÖRDER UNTER UNS (MURDERER AMONG US)—as an attack on the then-growing party. And he translated his horror at what he saw as festering within German society into not only what is considered a psychological horror classic, but the first film of its kind. Consistently engrossing, tightly wound and entirely thrilling, it’s not a movie to be missed.